Now that my new Sizzix succulent product designs have been introduced at the recent Creativation Show, I can now share my Personal-Planner cover illustration. 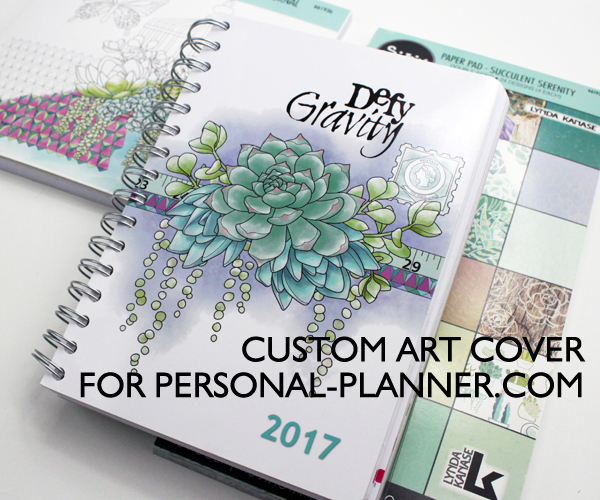 I am a big fan of the Personal-Planner.com, custom designed planners so this year I used illustrations from my Sizzix Succulent Serenity paper pad to design the custom cover of my 2017 planner. I used several illustrations from my Succulent Art Journal coloring book and Succulent Serenity paper pad. The words “Defy Gravity” reminds me daily, to rise above whatever is holding me back. The back of the planner has the illustration from one of my paper designs with all of the lovely colors. If you want to design your own planner cover, check out Personal-Planner.com and upload your own illustration. My planner is an A5 size so the cover illustrations had to be 1157px x 1614px to fit. The other fun thing to note is that my Sizzix Bindable die cuts the perfect edge to fit in the spiral rings of this planner. I am so thrilled to finally be able to share my custom planner cover.